IronRock Insurance Company Limited (ROC), for the three months ended March 31, 2018 posted gross premium of $155.02 million relative $61.94 million; this represents a 150% increase year over year. Change in gross provision for unearned premiums amounted to $99.46 million compared to $42.30 million in 2017 while excess of loss premium closed the period at 6.77 million (2017: $6.44 million), a 5% jump over the prior year’s corresponding period. As a result, gross insurance premium revenue amounted to $48.79 million relative to $13.20 million in 2017, a 270% improvement. Net insurance premium revenue amounted to $38.44 million, relative to $9.70 million for the previous year’s corresponding period. Commission expense totalled $13.92 million in contrast to $4.88 million in 2017, while commission income grew by 183% from $5.40 to total $15.27 million. Operating expense for the first quarter increased to $37.61 million relative to 2017’s figure of $31.03 million. as such, underwriting loss for the period amounted to $15.13 million relative to a loss of $33.50 million a year earlier. Investment income amounted to $8.06 million relative to $7.45 million in 2017. Foreign exchange gain amounted to $2.41 million versus a gain of $316,000 million in 2017. As a result, the company recorded a loss before taxes of $4.66 million compared to a loss of $27.28 million the prior period. 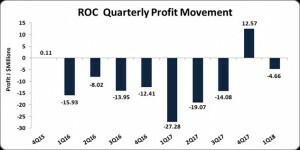 Loss for the period totalled $4.66 million compared to a loss of $27.28 million in 2017, a 83% improvement year over year. Loss per share for the quarter totalled $0.02 (2016: $0.13). The trailing twelve months loss per share amounted to $0.12. The stock price as at April 23, 2018 was $3.00. The numbers of shares used in the calculations are 214,000,000.00 units. As at March 31, 2018, ROC’s assets totalled $952.29 million (2017: $716.58 million). Reinsurance Assets and Insurance and Short-term investments contributed to the increase in the asset base closing the period at $202.58 million (2017: $62.85 million) and $83.12 million (2017: nil) respectively. Shareholder’s equity closed at $508.165 million (2017: $539.32 million). This resulted in a book value per share of $2.37 (2017: $2.52).